Kate Courtney finished the UCI World Cup season ranked 9th in the world, and goes into the world championships this weekend as one of the favorites. She certainly didn't know that in her first year racing at the elite level she would become one of the best mountain bikers in the world -- as one of the youngest riders on the circuit. "I didn't know you could even race bikes," she says. Now these days when her dad, Tom, wants to keep up on father-daughter rides, he often has to get out the electric bike. 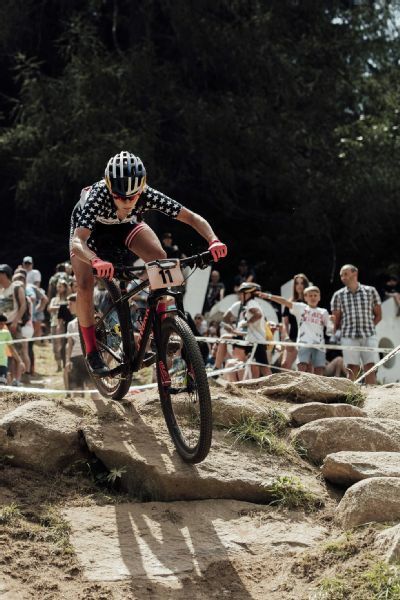 That's because the 22-year-old finished the season ranked ninth in the world, and she goes into the 2018 UCI Mountain Bike world championships in Lenzerheide, Switzerland, this weekend as one of the favorites. 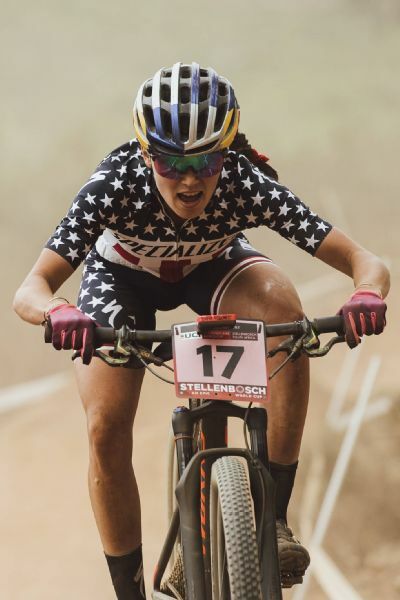 She also placed third at the elite World Cup mountain bike race in Canada in August, and she won (with her teammate, Annika Langvad) the famous Cape Epic stage race in South Africa earlier this year. And this is just her first year at the senior level -- and her first year training full time since graduating from Stanford last summer. Expect her to only get better. 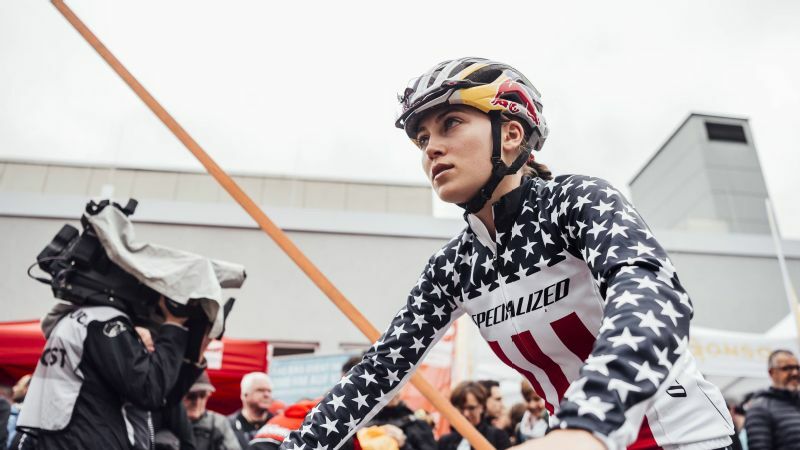 After all, while she was a full-time student finishing her biology degree, she also managed to win the U23 world title and become the first American woman to win a junior World Cup race. "[She's using] the same set of skills and determination that got her through Stanford," says Tom, and those skills are helping her work hard and focus on improving her cycling, getting better bit by bit. Lots of kids grow up riding their bikes around the neighborhood. And in Marin County, known as the birthplace of mountain biking, Courtney's casual bike rides and weekend ski trips to Tahoe weren't abnormal. She could have just been a pretty good athlete, successful and smart, but in high school something clicked. She started running on her high school cross-country team and won the conference title her freshman year. "She turned out to be a really good runner and nobody knew," says Tom. Kate Courtney just began training full time in June 2017, moving up from U23 races to the elite field for the 2018 season. But she didn't love running. She liked her teammates and she liked training, but running wasn't exciting enough for her. "It didn't fire me up," she says. That spring she joined the high school mountain bike team, just to stay in shape, and she loved it. It was technical and tactical, exciting and hard. She had to stay focused the whole time. "It's a combo of being the most fun ever and being really tough," she says. She was good, winning a few high school races, but she still had a lot to learn. The high school mountain bike league -- new at the time -- helped her hone her skills. Then her junior year she got the opportunity to go to Europe to compete in a couple of junior World Cup races. It was her and five boys, all over 20 years old. The level of racing was incredibly technical and much harder than she'd seen before. At her first race in Europe, she placed in the top 10. But the next weekend, she crashed multiple times and didn't finish. "I could be good and [then], wow, I'm out of my league," she says, remembering. That lit a fire under her. She could see both her potential and what she needed to work on. Mountain biking can seem terrifying -- in races, a group of women all speed down a trail as hard as they can, over rocks and around trees. Crashes are common. Kate Courtney rides seven days a week, but tries to mix in some fun, often stopping at taco shops on training rides. "Some people learn as kids. They crash and figure it out. But that was not the case for me," she says. Since she didn't pick up mountain biking competitively until she was in high school, Courtney had to work to learn the skills necessary. She went to USA Cycling camps and practiced cornering and dropping off small jumps. She improved -- a little at a time. Even as she started school at Stanford, she signed a professional contract with the bike company Specialized. 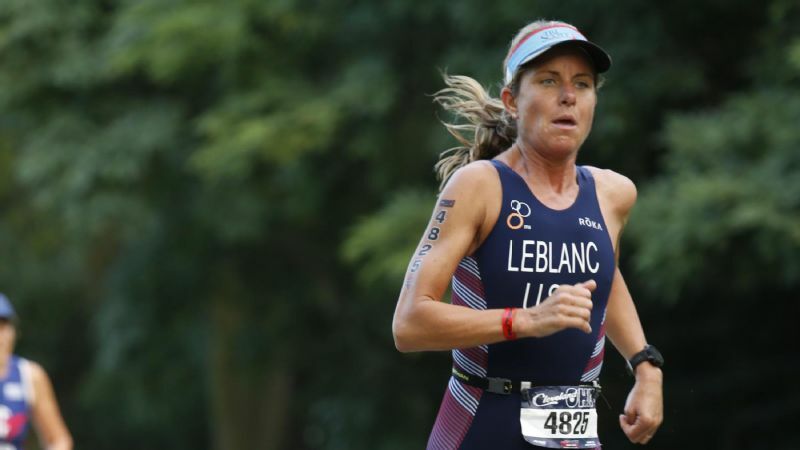 Since mountain biking isn't a varsity or NCAA sport, she had to fit in her training on her own, in between classes, and then fly to races on weekends. Some teachers "didn't love it," she says, but she learned to make things work by being proactive. At the beginning of each semester, she'd sign up for a bunch of classes and then go talk to each professor on the first day. She'd explain that she was willing to do extra work or make up whatever she missed because of races. If the teachers said no way, you have to be here for every class, then she'd drop those classes. Sometimes her plan didn't work out and she'd just have to work harder and take her knocks. Sometimes it was really tough out there riding in the mountains around Palo Alto, in the rain, by herself, and then rushing back to study. But she did it. In June 2017, she graduated and started training full time. For the 2018 season, she also moved up from the U23 races to the elite field -- the cream of the crop. That upped the level of competition, a lot. Kate Courtney balanced training and racing with class work while getting her degree at Stanford University. "It's been a huge season of learning lessons," she says. But she's committed herself to getting better. She rides seven days per week -- and even in the rainy San Francisco winters, she rode every single day outside. She does gym work another two to three days each week and yoga. She changed coaches a couple of years ago to up her game. 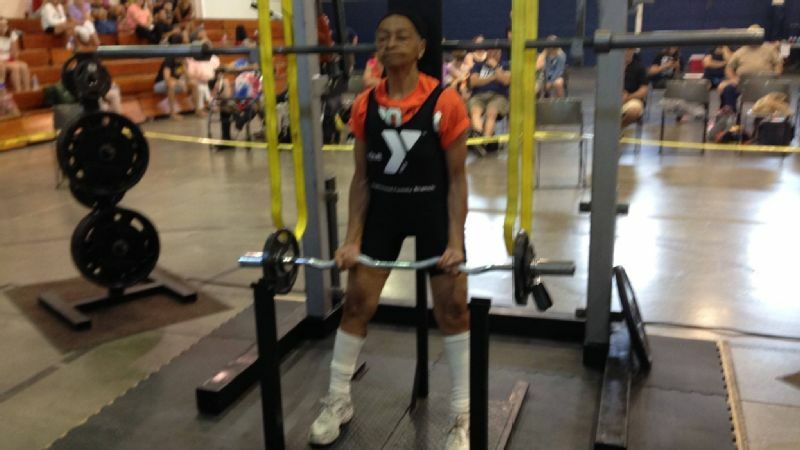 She works with a nutritionist and a physical therapist, a strength coach and a sports psychologist. She's become focused on improving her mental game and practicing those skills, too. When she races, Specialized has a mechanic for her bike. During college, her parents helped her manage her obligations and schedule, and now her boyfriend and other local professional women cyclists train with her. It takes a team. "What people don't see is the level of commitment, the level of intensity that goes into progressing and getting better," says Tom. "She's just a grinder. She works so hard." Earlier this year, her coach, Jim Miller, wanted her to put her name in the ring for Cape Epic -- a grueling eight-day mountain bike race done in pairs. She didn't have the resume or the background, and the media covering the event were skeptical. "I didn't know if I'd be capable of it," she says. She was teamed up with Langvad, a world champion, and there was genuine concern Langvad might simply wear her out in the first few days and she wouldn't be able to keep up. 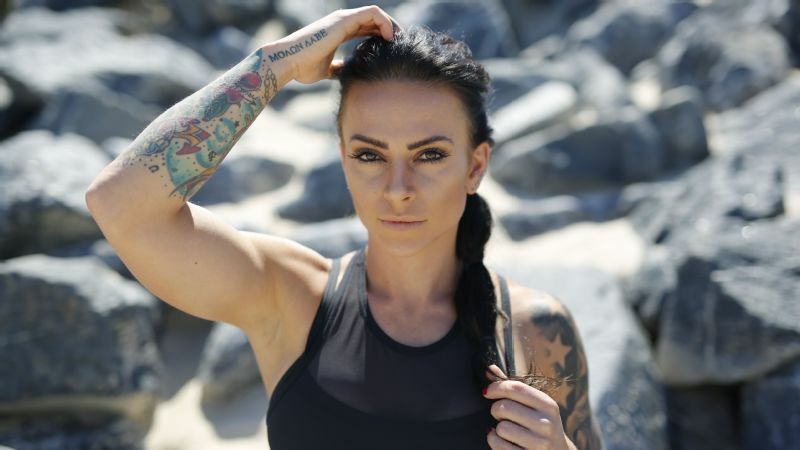 Courtney is one of the few American women competing at this level and one of the first to be racking up podiums on the international elite circuit. She wants to help inspire the next generation, and she's become a popular figure in the sport, with 115,000 followers on Instagram, both because she seems to be having fun -- riding to taco shops is a recurring theme -- but also because she's realistic about how hard it is to make the marginal gains when you're so close to the top. 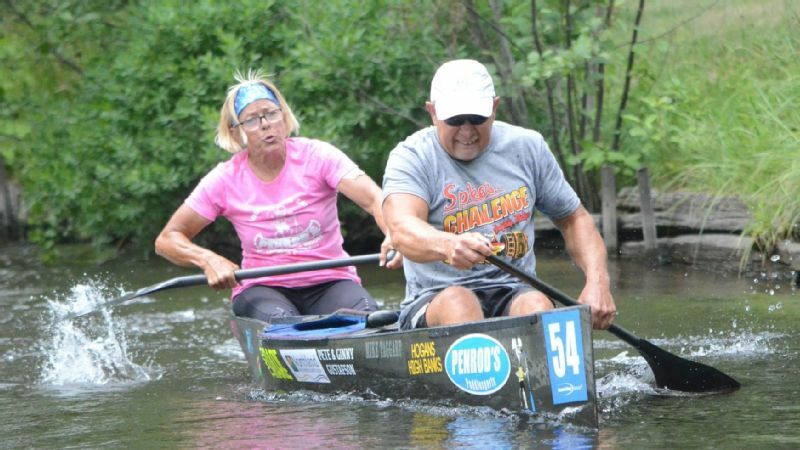 "It's a sport where there's a lot of incremental progress," she says. Some days that means crashing and fighting back through the field. Some days it means learning what she can during an injury. And some days it all looks glamorous as she crosses the line for a victory and throws her hands up. As she preaches on her Instagram and to her fans: It's all about progress, not perfection.